Ripple Grove Press, 9780991386697, 44pp. Grandmother Thorn treasures her garden, where not a leaf, twig or pebble is allowed out of place. But when a persistent plant sprouts without her permission, Grandmother begins to unravel. “Her hair became as tangled as the vines on her fence. Her garden fell into disrepair. 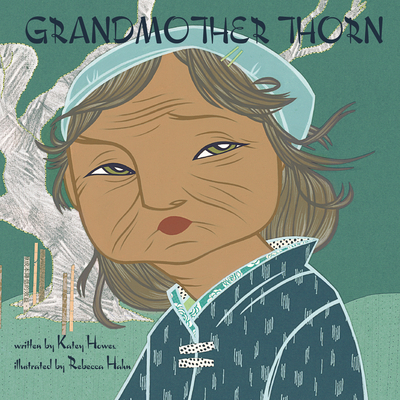 One morning, she did not rake the path.” A dear friend, the passage of seasons, and a gift only nature can offer help Grandmother Thorn discover that some things are beyond our control, and that sweetness can blossom in unexpected places. Katey Howes is a former physical therapist who now writes full time from her home office. She loves connecting kids with the natural world through exploration, art, and science. She lives in Chesterfield, New Jersey. Rebecca Hahn is an artist who enjoys working with a diverse range of media including animation. She previously worked for the Walt Disney Company where she drew the Winnie the Pooh characters for the Consumer Products Division. She has since left the corporate world to work from her studio where she continues to create for business and pleasure, tending to her long time loves of story, concept, and craft. She lives in Portland, Oregon.